A great way to use up the summer vegetables, a perfect summer dinner is done in a snap with minimal clean up with this Sheet Pan Balsamic Shrimp and Summer Vegetables. Place one oven rack in the center of the oven, and the other rack 4 inches from the top heat. Spray a sheet pan with cooking spray. Preheat the oven to 375ºF. Combine the zucchini, yellow squash, bell pepper, tomatoes, and onion on the prepared sheet pan and season with 1/2 teaspoon salt, 1/2 teaspoon pepper, 1/4 cup of the olive oil, 2 tablespoons of the vinegar and the lemon juice. Toss to coat. Roast the vegetables on the center rack until they are softened and they are beginning to brown on the edges, about 20-25 minutes. Remove the sheet pan from the oven. 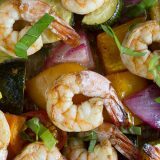 While the vegetables are cooking, place the shrimp in a large bowl and add 1/4 teaspoon salt, the remaining 1 tablespoon of olive oil, the remaining 1 tablespoon of vinegar, and the Worcestershire sauce. Toss gently. Let the shrimp marinate at room temperature while the vegetables are roasting. Once you remove the vegetables from the oven, turn the oven to broil. Scatter the shrimp and the marinade over the vegetables in a single layer. Broil on the upper rack in the oven until the shrimp are cooked through, about 5 minutes. Scatter the basil over the finished dish. Serve with bread or a side of couscous.